Jonathan Savage had stuck with the traditional ways of rearing beef for all of his farming life, using home-grown cereals and roots, and adding by-products or other ingredients as they came on to the market. The daily routine of rolling grain took one of the family team around three hours a day, and everything including forage would be mixed in the wagon. With 445 hectares (1,100 acres) of arable, up to 500 ewes, 150 suckler cows and 500 bullocks and heifers for finishing, the team at Parkhall and Grange Farms, just south of Chesterfield near the Yorkshire-Derbyshire border, had more than enough other work without the chore of milling and mixing. And while none of the family team – including Mr Savage’s father, John, and his nephew, Thomas Gregory – felt there was anything seriously wrong with the system they had run for several years, there were signs the cattle could be performing better. This information is brought to you by ForFarmers. Visit www.ForFarmers.co.uk for more information. “Father does a lot of the buying and travels to markets anywhere from Hexham in the north to Wales in the south, choosing anything he thinks has good conformation and will produce a high quality end product,” says Mr Savage. Selecting stores from 12-20 months old, they would arrive on the farm and be wormed on their arrival, and would then go straight on to the total mixed ration, gradually increasing their intakes. He describes how the rapidly fermentable carbohydrates in the rolled cereals would tend to lead to acidosis, the animals would start to scour and generally appear sweaty and stressed, and occasionally he would lose one to bloat. “Once you have stressed animals they are prone to other issues and pneumonia in particular can sweep through a shed,” he says. It was with this in mind Mr Savage spoke to his feed adviser, James Milligan from ForFarmers, who suggested his cattle could benefit from a product containing Levucell. “James convinced me to try a compound feed called Super Grade which he said would allow for higher intakes and lead to less stress, faster growth and good health,” he says. Introducing the compound alongside ad lib wheat straw in February 2015, he says he was particularly swayed into using the product because it contained the live yeast, Levucell, but he also liked the idea of the product’s consistency and being certain of its provenance. “It is about knowing everything you are putting in. With these nuts, you have a full breakdown of what’s in each kilogram and you know it has all of the vitamins and minerals the cattle will need,” he says. The Levucell in the feed is a rumen specific product, which helps maintain the health of the rumen by mopping up lactic acid, scavenging oxygen, maintaining pH at around 6.2 and improving fibre digestion. “Straight away I could see the benefits,” says Mr Savage. “And it was easy to increase intakes when animals arrived on the farm, so the cattle would be on complete ad lib – or around 10kg/day – within less than a week of arriving.” Daily liveweight gains were said to range from 1.5kg to 2kg/day depending on breed and age, and most of the stock were ready for sale within 90 days of arrival. The upshot he says is animals which finish quicker, look good when sold at market and are fetching good prices and attracting return buyers. Convinced the beef enterprise will improve its profitability in the final assessment, he says: “Yes, we are paying more for the feed and we could find a cheaper product, but I am 100 per cent behind what we are doing now. “It’s clean, straightforward and quick for me to fetch a lorry load of nuts every week, the cattle look a lot happier and are growing really well – and we’ve also got spare wheat and barley to sell on the open market. Time means money for anyone in the business of farming, and this probably rings more true today than for any generation before. But this does not simply mean ‘time’ in relation to the growing cost of good quality labour; it also means ‘time’ in relation to the period livestock spend being reared on the farm. “When you are rearing intensive beef, every extra day each animal spends on the farm represents a cost to the business, so as a rule, the faster livestock are finished, the higher profits will be,” says Nick Berni, ruminant product manager with ForFarmers, who also remarks that younger animals have a better feed conversion efficiency and lower maintenance costs. It is with this in mind that ForFarmers beef feeds contain the live yeast, Levucell, which can significantly improve liveweight gain in beef cattle. “Levucell works extremely well in intensive situations where animals are being pushed to grow,” says Mr Berni. “It does this by maintaining a healthy rumen environment and consistent pH. “By utilising lactic acid it helps to regulate the rumen pH at close to the desirable pH 6.2. “The overall effect is improved rumen health and performance in other words, it reduces the risk of acidosis and damage to the rumen wall,” he says. 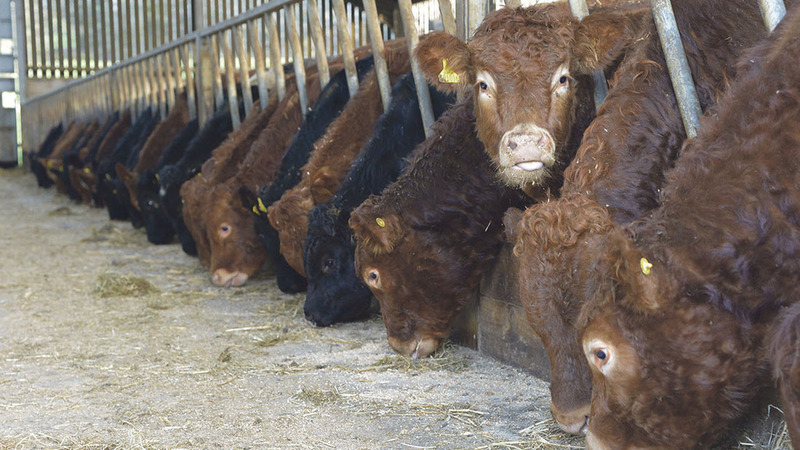 With all these effects having a positive impact on dry matter intakes which can be safely increased in intensive systems, he says liveweight gain can be expected to rise and cattle will finish quicker.